Box Text: Recover the stolen colors of Prism Island! Someone or something is draining the world of its color! Who would do such a thing?! Join Huey, your trusty paint-can partner, on an all-new adventure to save Prism Island! -Solve puzzles with the power of paper! -Paint colorless spots to pen new paths! -Whack 'em with your hammer! Study your enemies before selecting your cards. Think about the order too. Solve puzzles with Thing Cards, and use them in battle. 10-07-2016 aliensstudios Box Text Recover the stolen colors of Prism Island! Someone or something is draining the world of its color! Who would do such a thing?! Join Huey, your trusty paint-can partner, on an all-new adventure to save Prism Island! -Solve puzzles with the power of paper! -Paint colorless spots to pen new paths! 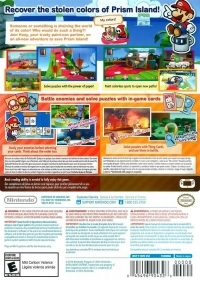 Battle enemies and solve puzzles with in-game cards -Whack 'em with your hammer! -Turn up the heat! -Put out the fire! Study your enemies before selecting your cards. Think about the order too. Solve puzzles with Thing Cards, and use them in battle. 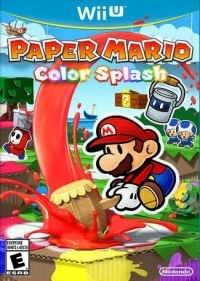 This is a list of VGCollect users who have Paper Mario: Color Splash in their Collection. This is a list of VGCollect users who have Paper Mario: Color Splash in their Sell List. 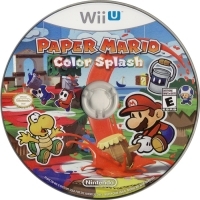 This is a list of VGCollect users who have Paper Mario: Color Splash in their Wish List.